It’s finally here. The Silmaril Awards finally has its own site. When these online awards launched in 2016 as a wild idea from authors by Jenelle Schmidt and DJ Edwardson we had no idea just how successful and fun they would turn out to be. We love writing fantasy because we love reading fantasy. And while there are a host of awards out there for fantasy authors and books to win, we thought it would be wonderful if there was one just for the characters. And since the characters cannot actually appear to receive them, what better venue to have them than online in our own virtual amphitheater where we can write them back into existence? These are not just our awards, though. They are by fans and for fans of fantasy literature. Anyone can nominate a character and anyone can vote for the ones who get on the final ballot. In our original estimation, we thought pretty much all of the winners would come from The Hobbit or The Lord of the Rings, and so we decided to instead have Tolkien’s characters present the awards. Thus was born the theming behind the awards and the choice to award silmarils instead of statues. As a side note, DJ’s initial idea was to present golden statues of each of the iconic Lord of the Rings characters, a la the oscars, but happily that got changed. The first year’s awards featured several now retired categories. We found that certain awards spoiled books people hadn’t read too much and others just didn’t make as much sense, as they were not based around a character so much as an item or a type of scene. And so the awards arrived, stumbling and fumbling, into their present state today. They may be further refined or expanded in the future. We actually considered an 11th award this year, but for now, the stage is set. The characters are waiting in the wings. 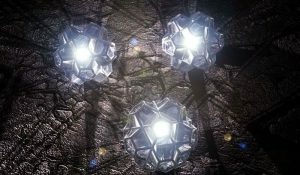 The silmarils have been polished. The lights are dimmed. And any day now it will be…show time! We hope you enjoy the site and that these awards will continue for many years to come!